eNLokam: Bharat Ratna to Prof MS Swaminathan! Prof MS Swaminathan, eminent agricultural scientist and one of the founders of the Green Revolution will soon be honoured with Bharat Ratna, the country’s top civilian award. This was announced here by Jayanthi Natarajan, minister of state for environment and forests. 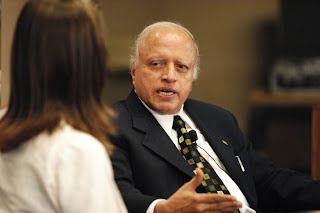 “Prof Swaminathan is a national treasure. No other scientist in India has influenced the government, farmers and the civil society as he has. The government will soon make an announcement about honouring him with the Bharat Ratna ,” Natarajan said while releasing the 21st annual report of the MS Swaminathan Research Foundation, a Chennai-based initiative launched by him to help the country’s farming community on sustainable development. Prof Swaminathan will become the eighth person from Tamil Nadu to be honoured with Bharat Ratna.